Ever wondered how professional podcasters get their sound right? Are you a drummer and have issues with your neighbors? Michael O’Neal, a professional drummer and podcaster, explains how he managed to kill two birds with one stone: soundproof his drum room to avoid neighbor’s complaints and create an acoustically treated audio recording room at the same time! Michael hosts a podcast with the goal to help people to make that important step to become successful on their own. You can listen to his award winning show at www.solopreneurhour.com. As the show became more and more successful Michael needed to come up with a solution to improve the sound quality in his studio and at the same time, being a drummer, he needed to stop the sound from escaping the room so he can play his drums! Previously, Michael tried to use acoustics gobos, but that did not help much. It might have done something to cut early reflections, but did nothing to stop sound transmission. Outside the room his drums were heard loud and clear. After thorough research he found Producer’s Choice Acoustic blankets. Michael treated his studio with these sound blankets and he was amazed by the results! Michael also gives useful tips to fellow drummers to avoid potential conflicts with new neighbors. This entry was posted in Acoustic Product Reviews and Testimonials, Drum Room Acoustic Treatment, Videos and tagged drum room sound proofing, podcasting room and studio. 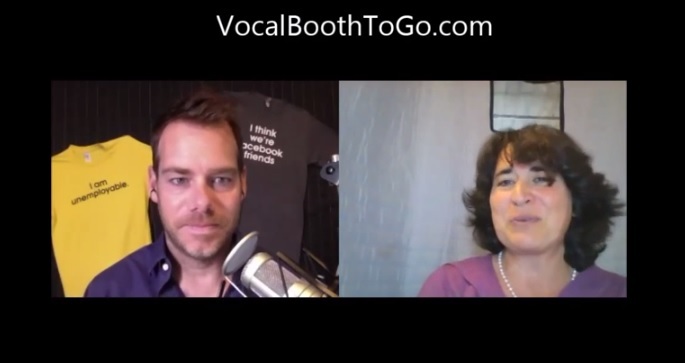 vocalboothtogo products for soundproofing, producer's choice sound blankets, soundproofing for podcasters. How to Soundproof Drum Room and Recording Studio with Producer’s Choice Sound Blankets Video Testimonial .